Andy Warhol’s “Triple Elvis” recently sold for a cool $81.9 million at auction. Whoa!!!! Yep, 81 point 9 million dollars! I started my art career at the Andy Warhol Museum. It wasn’t a very glamorous job (I answered the phone and spent most of my day saying, “Please take the elevator up to the top floor, and then work your way down. There are educational activities in the basement.” That said, I enjoyed being around the art. 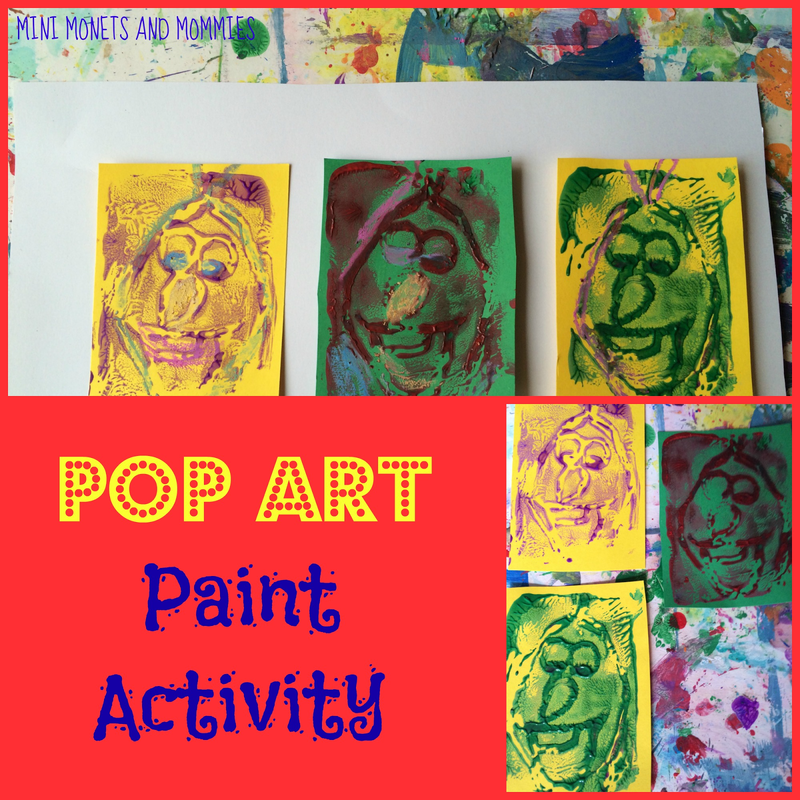 While pop art might not seem like the stuff that early childhood lessons are made of, you can introduce the ideas behind it to your young child. I’ve seen this go horribly wrong. When I first started teaching children’s art classes (in a museum), my co-teacher started on a major pop art downward spiral. His intro began simple enough, but then turned into something that sound more like a college lecture than a pre-k discussion. Lesson learned. I like to take the simple approach. It’s art for the masses and (in the case of Warhol) often features famous and infamous subjects. To simplify this idea, the activity at hand deals with the “famous people” in your child’s life. These don’t have to be real people. A favorite character from a book, TV show or movie will work just as well. Like Warhol, your child is going to explore making multiples. Instead of drawing one thing or creating a painting, she can make several different identical images. If that sounds boring, it isn’t. By using different colors of paint, paper and chalk, your child will take each image from the same to stand-out. And, it’s super-easy! · Styrofoam plate – You can buy this at a craft store or you can reuse the top of an egg carton (the foam, not the cardboard, kind) or a fruit/veggie packaging tray. · A picture of your child’s favorite famous character – You can use a printable or a coloring page for an easy outline shape. We chose Olaf from Disney's Frozen. 1. Cut the famous figure picture to the same size as the styrofoam piece. 2. Put the picture on top of the foam. Have your child use the pencil to trace the outline of the image. She will have to press down firmly to go through the paper and into the styrofoam. Your child shouldn’t press so hard that the pencil goes through the foam plate. 3. Take the picture off of the foam. Have your child retrace any lines that are too shallow. 4. Paint or roll tempera over the plate. Your child doesn’t need to layer on a thick coat and shouldn’t press the paint into the lines. 5. Turn the styrofoam over and press it onto a piece of card stock paper. Your child should pat the back of the foam to transfer the color. 6. Repeat this process for the same color and then switch up the paint and paper hues. Wipe the printing plate off in between passes. 7. Let the artwork dry. 8. 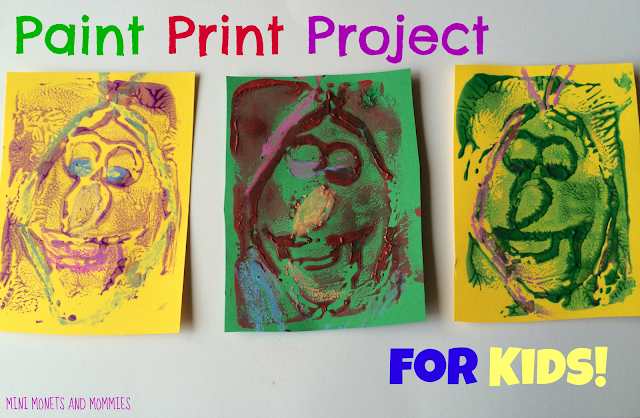 Add details to the dried prints with the chalk. Have your child make each piece different. For example, she can outline the character’s face in pink chalk in the first artwork and then draw around the eyes with green in the second. 9. Glue the prints onto a bigger piece of cardstock or poster board in a row. Are you looking for more activities with a famous artist theme? Follow my Pinterest board for ideas! Follow Mini Monets and Mommies's board Famous Artist Kids' Activities on Pinterest. This is fantastic! a great tutorial. I am not artistically inclined, but my 2 year old loves any form of art. I will have to do the etching for her, but the rest of this she will have fun with. I just signed up to follow your Pinterest board so I can get more ideas. I don't know why it took me so long. Thanks for sharing. Thanks! It is a fun project. Your child will enjoy it! Wow! That is amazing! So artistic! Love them! Thanks. It's so much fun to do. The kids love it. wow! That's a really good idea! 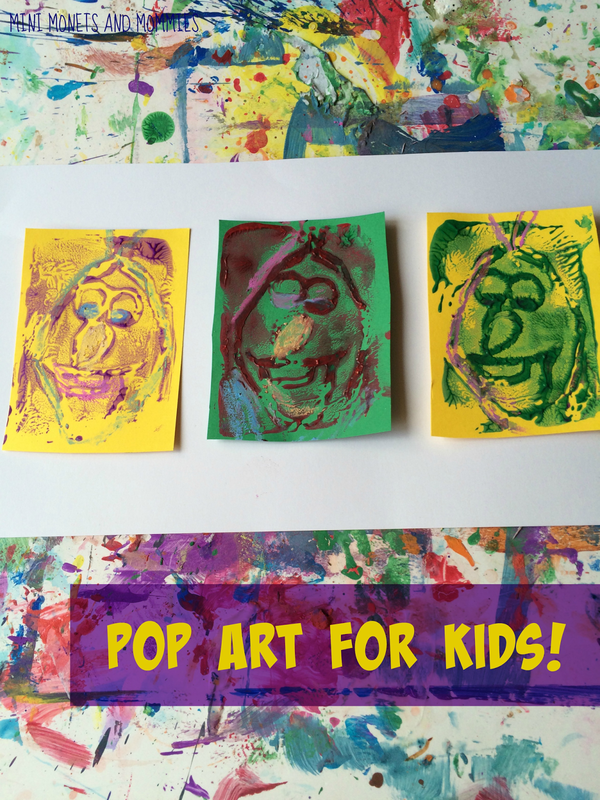 I love Warhol and I've got two groovy homeschoolers who would love this project! Good idea! That's perfect for kids! Although some claim that antique original print auction possess a surperb character quality that simply cannot be duplicated, many other observers aren't able to distinguish an original print from a parallel reproduced print. Rainbow Art for Black Friday Sale Day!